The selection process was a massive win for transparency. The UN formally elected António Guterres, the former prime minister of Portugal, Thursday as the body’s new secretary-general. Guterres has broad support from both key global donor nations (the US, Russia, China, and others) and the NGO community. After six straw polls, the global multilateral organization unified around Guterres, beating out a range of other candidates in the most open selection-process of this organization’s history. Guterres has been the United Nations High Commissioner for Refugees for the past 10 years. Under his direction, the UNHCR dramatically transformed and, as a result, was able to face the biggest refugee crisis of the century. As prime minister of Portugal, Guterres was known for his transparency, ethics, and commitment to dialogue. His first term featured strong economic growth that allowed him to improve welfare throughout the country and cut the debt. When his political party faced mounting setbacks during his second term, he resigned and dissolved the parliament, making way for a successor that had the public’s backing. "Mr. Guterres has the character, vision, and skills needed to lead the United Nations at this critical moment and to reform its organizations and operations to better meet these unprecedented challenges," the White House wrote in a statement. He is seen by many as a stark break from the quiet diplomacy of Ban ki-Moon of South Korea, who has led the UN for two, five-year terms. "Secretary-General-elect Guterres is well known to all of us in the hall," Ban said to the UN assembly. "But he is perhaps best known where it counts most: on the frontlines of armed conflict and humanitarian suffering." Guterres is “a nimble, eloquent polyglot who has an ability to connect to an audience as you would expect of any skilled politician,” according to UN Dispatch. Guterres enters at a time when the influence of the UN is seen by some as slipping. The central purpose of the organization is to end conflict. Today, conflict afflicts many parts of the world and the destruction caused by the civil war in Syria seems intractable. But having led a country and navigated a catastrophic refugee crisis, Guterres is no stranger to challenge. There are 62 million refugees in the world today and he is likely to prioritize this humanitarian crisis. The selection of the 9th secretary-general was, in many ways, revolutionary. In the past, the process was closed to the public and subject to opaque demands. Since the secretary-general works with 193 member states of the UN and oversees 40,000 staff and 30 UN funds, programmes, and agencies, critics called for more public input and the 1 for 7 billion campaign was born to advocate on behalf of the world’s citizens. This year, reformers insisted on greater transparency and, for the first time ever, prospective candidates made appeals to the public and participated in debates, one of which was hosted by Global Citizen. It was a refreshing dose of candor. Furthermore, normal people were able to directly ask the candidates questions about their backgrounds and how they would govern. While the voting process remained the same as in the past, the reforms set the tone for the entire campaign and suggest that the UN will enter a new chapter of transparency. 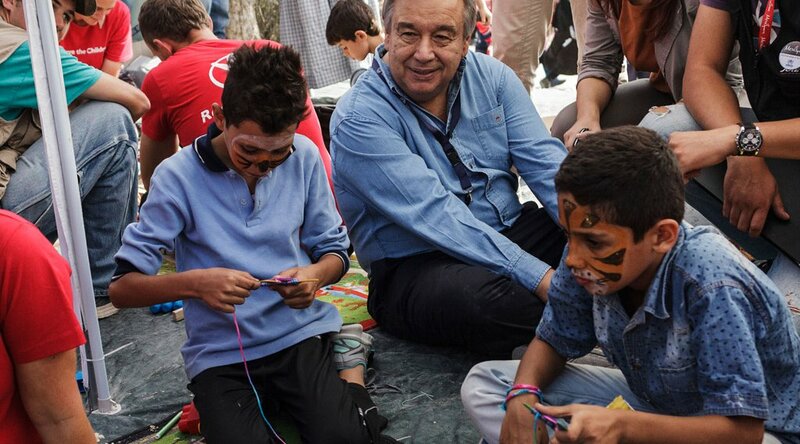 If that’s the case, Guterres is the right person for the role and Global Citizen looks forward to working with him on tackling the world’s most pressing challenges.